The Manawatu River was a defining feature of the Manawatu Region, which was the subject of my recently published book, Ravaged Beauty. This has led me to research the environmental history of our rivers more broadly. One thing that becomes very clear very quickly is the nature of early European attitudes to rivers in New Zealand. Unlike Maori, who saw rivers as entities to be valued, treasured and respected, and often indivisible from themselves or their ancestors, the European immigrants who settled on these shores in the 19th century saw rivers almost entirely in a negative or utilitarian light. 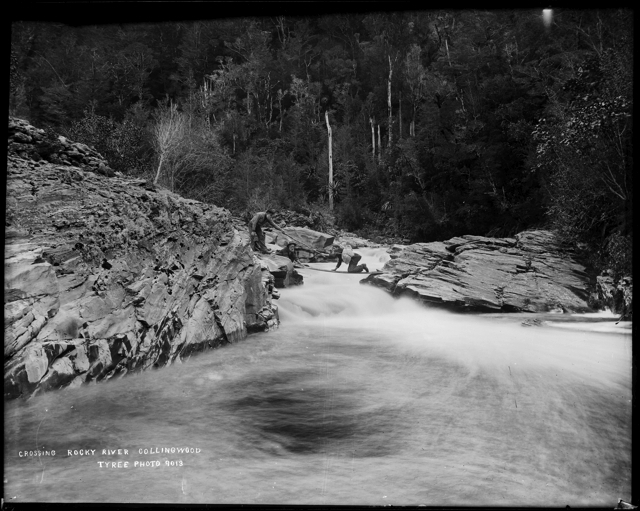 Negative in the sense that rivers were seen as destructive and murderous (death by drowning was so prevalent at first that it was referred to as “the New Zealand death”). The utilitarian view of rivers stemmed from the fundamental belief (still evident today in some quarters) that water flowing unimpeded to the sea was “wasted”. And indeed, the applications for flowing water were manifold! In addition to drinking and other household uses, there was gold-mining, drainage of waste, hydroelectricity generation and irrigation … only (much) later did the intrinsic or even scenic value of rivers come to be given official recognition. Of course most European settlers came from England, Scotland and Ireland. So I am interested in what perceptions and values (including in law) they brought with them to New Zealand. This week I asked the environmental history community on Twitter for recommendations for readings in this area, and received a veritable flurry of fluvial-related suggestions, mainly from the Northern Hemisphere. Thank you – I am looking forward to my reading over the coming weeks. Previous Article When is a river a drain? This is a truly significant topic relating to the present attitudes regarding waterways. We can’t turn back our history, but I have to hope we can re-learn some new/old attitudes towards how we use natural resources. I read a comment on twitter about the proposed dams in the Wairarapa which talked about 98% of water in rivers ‘just flowing straight out to sea’ as if it was being wasted, which struck me as very odd – but now I can see where that came from! I’ll be interested to hear about what you learn about anglo attitudes to rivers – they seem to be more loved now in the UK than they do here, but that may be a reflection of changing land uses. Thanks Carringtonia. Yes it will be interesting to see to what extent attitudes to rivers in Britain translated into NZers’ attitudes to rivers, especially in light of the very different geological, topographical and climatic (and therefore hydrological) conditions here.